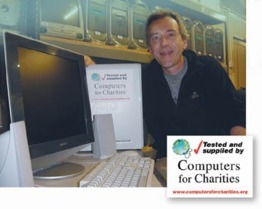 Donating working, redundant computers provides real benefit for Charities, Voluntary Organisaitions and Schools, plus protecting our environment. It is thanks to Corporates, Universities, Government departments and individuals, that CfC has aided thousands of Charities & projects across the UK and Worldwide (106 countries) since 1994. But more equipment is needed to supply the need. Corporate computer donations & similar to Charities can provide cost savings for companies whilst providing invaluable community benefit. "NHS PCT saved £100,000 by donating to CfC. Faced with costs of £100 per item to collect, data wipe, certificate. CfC recycled & restored 1000 systems, aiding UK charities and schools"
All systems are fully wiped before installing new educational licensed operating systems and software as "Microsoft authorised Refurbishers". Machines are Soak & PAT tested prior to despatch for the benefit of registered organisations only. Please Note: Equipment can be delivered or dropped off at our workshop in Eastbourne, East Sussex by arrangement. Corporates, Universities, Local Government, Schools: CfC sadly is unable to provcide collection services for all items offered, requiring to be viable in respect of quantity. In such CfC generally provides Free Nationwide & European collection services for such viable working equipment. Primarily requiring Desktop, Towers, Laptops. Mac & PC minimum i3 level or OS 10.14 Mac to benefit UK Voluntary organisations and Overseas. Home collection / Company smaller quantities. Please note collection services are not available at this time. Need more information regarding Donatiing? Enquiries can be made by phone.T: 01323 848588 or email and via this website - (Enquire Now). Corporate, Local government, Charities, Schools, Hospitals - Contact your local council for advice or speak to "Recycling for Charities" our sister charity specialising in IT WEEE recycling. Including bulk IT disposal. Recycling for Charities, is the recycling arm of Computers for Charities, providing National WEEE IT recycling services for older or non working IT equipment. We offer environmental and community benefits with competitive pricing as an established "not for profit" organisation. Implemented on 1st July 2007, EU Waste Electrical and Electronic Equipment directive (WEEE). Electrical / IT waste is the fastest growing element in the municipal waste stream. Many hazardous substances are present in everyday IT equipment (including older CRT monitors) and the WEEE directives classify many such items as Hazardous Waste, effectively to safeguard against toxic landfill disposal and promote better recycling processes. Please Note: The following items "Hazardous Waste" require appropriate disposal: CRT monitors including older iMac's, UPS systems, battery waste, etc.